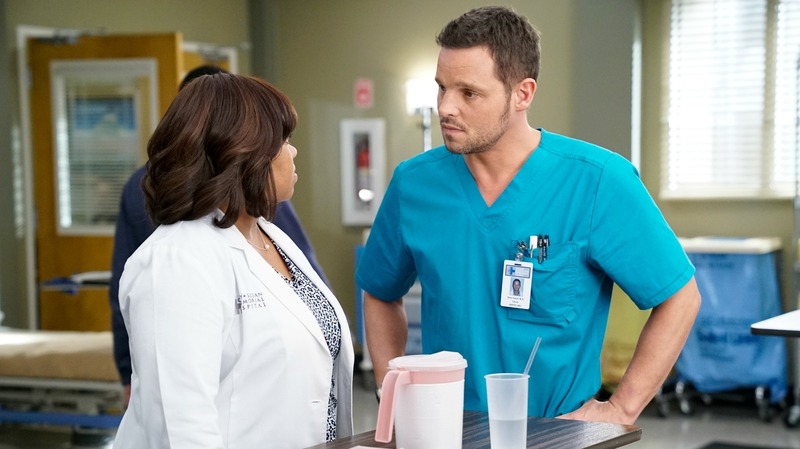 Did Grey’s Anatomy‘s Alex Karev just confirm he’s leaving the show? Welp, I’m convinced. The fall 2016 TV season is trying to kill us all. The latest clue? This week’s episode of Grey’s Anatomy, in which beloved character Alex Karev may very well have confirmed his departure from the veteran ABC series. But let’s zip back in time a minute, shall we? The week started off on a brutally bad note with the Season 7 premiere of The Walking Dead on Sunday. If you watched it, you know what I’m talking about. If you haven’t yet, be forewarned — it will break your effing heart. So coming into Grey’s this week, I was looking for a little levity. Sure, the show deals largely in drama, but it pinch-hits on the feel-good roster too. But nope. Or to be more precise, hell nope. This was not that episode, which became painfully apparent early on when Alex ran into a pregnant lady at his court hearing and was alarmed by a rash on her hands. Fast-forward into the episode a bit after said woman has stopped into the Denny Duquette Memorial Clinic that Alex is currently running, and we find out she has advanced pancreatic cancer. Prognosis = not good. There were other disturbing goings on at the hospital we could discuss, like how cozy Jo and DeLuca have gotten (already?!). Or how Catherine wants to stage a coup and kick her own husband, Dr. Webber, out of his job as director of the residency program. Let’s be real, though: This week’s episode was really about Alex. The entire episode was peppered with moments guaranteed to make us love him more. The way he fought for his patient, even to the detriment of his own career. The way he was there for Amelia in a way she didn’t even know she needed. The way he is with Meredith. Do you hear that? It’s the sound of me pumping the metaphorical brakes. Wait, dear, sweet Alex. What do you mean “for as long as we can.” What happened at that hearing, Alex? That sounded a lot like a departure confirmation. Since Alex doesn’t explicitly spell out what went down during his hearing (over attacking DeLuca), we’re left to interpret. And it doesn’t look good for our hero when he tells Mer she needs to be nicer to Amelia because he won’t always be around. It’s in this moment I actually Googled “hugging chair,” because c’mon… I just need someone to hold me for a little while. Or, you know, sedate me. Whatevs. I’m not picky. So what does this mean for Grey’s moving forward? Again, it’s still too gosh damn early to tell, which sounds ridiculous considering we’re already six episodes into an arc that started at the close of last season. If it means we get more time with Alex, though, we’ll take it. Right? There’s been radio silence on Justin Chambers’ part as to whether or not he is leaving the show. This makes sense because they obviously have to keep these things shrouded in secrecy so as not to dilute the suspense of the season. I’ve suggested Shonda Rhimes could be setting his character up for a spinoff, and I’m basically hoping and praying (and begging) that’s how this whole storyline plays out. I also think it’s highly possible Chambers is simply choosing to move on and pursue other opportunities. For that, we can’t blame him. I mean, don’t get me wrong — we totally do, and we’ll be salty about it until the end. Alas, we still adore him. Just like Mer, we can’t quit Alex Karev. What do you think? Did Alex just confirm he’s leaving?